Whether?you're new to writing drivers on Windows, or you just want to bone-up on some core concepts, this is the section you'll want. The Basics contains articles on fundamental concepts of Windows driver writing and systems internals.? From articles on basic techniques to answers to your frequently asked questions, you'll find it here. The section is not actively maintained and is provided for archive purposes only! Please go to http://www.osr.com/nt-insider for the latest content. Would you believe this is among the most frequently read articles on OSR Online? It is, with over?thirty thousand people having read it so far. So, you want to learn how to write Windows device drivers but you're not sure where to start? Having assisted thousands of developers get up to speed on writing drivers, we figured it was about time that we offered some "getting started" resources to newbie driver writers. While not intended to be an exhaustive driver writer FAQ, the list below is a compilation of common questions (and answers, of course!) we hear from those new to the driver space. Got a crash dump? Analyze it instantly online (and for free) using OSR's Instant Online Crash Dump Analyzer. Accepts mini-dumps and kernel summary dumps... you can even zip and upload PDBs. Check it out! Check this section for information that's fundamental to driver development on Windows. If MDLs are opaque, what's the right way to gain access to their contents? This article, a follow-on to our article on MDLs, discusses the various methods that are provided for access to the fields in the MDL object. We've just posted the latest update of our sample KMDF driver for the SeaLevel Systems DIO24 (8008) board. Living with 64-bit Windows has its pitfalls. Of course, one way to deal with this is to keep two different versions installed - but beware if you try to do this from the same boot image. What causes the NO_MORE_IRP_STACK_LOCATIONS bugcheck? In our continuing series of articles on common bugcheck codes, we reveal all. Did your system ever die with KERNEL_DATA_INPAGE_ERROR? Here's what it means. Ever wonder what causes the particularly illogical sounding bugcheck PAGE_FAULT_IN_NONPAGED_AREA? Here are the details, including how to debug the problem and what you might need to look at in your driver to fix it. Ever wonder what causes the bugcheck PFN_LIST_CORRUPT? Here are the details. The DDK and IFS Kit include buildable drivers but the system file protection feature in Windows makes it difficult to replace the file. This article describes a simple techinque, using the kernel debugger, to replace that file and bypass system file protection. Most Windows Driver Development Interfaces (DDIs) indicate their success or failure by returning a status. But did you know that some also raise exceptions? Here's the list, thanks to NTDEV/NTFSD member (and driver expert) Nick Ryan. The members of the NTDEV and NTFSD lists answer countless questions on the basic techniques of driver writing. This article is an on-going attempt to capture many of the Frequently Asked Questions and their answers. This article describes the basics of the term thread and how it is used within Windows. The x86 (IA-32) processor can run in different addressing modes, one of which is called Real Mode. This article provides a basic description of real mode processing and its applicability to modern Windows. Windows is a Demand Paged Virtual Memory System. This means it relies upon a page translation mechanism to map from the memory addresses used by the CPU to the memory addresses used by the computer. This article explains one of the basic concepts in this process - the "page fault". Setting up symbols for the WinDBG debugger is often something that gives first time users a problem. This article discusses the basics of setting up symbols with WinDBG and how to diagnose problems. If you're new to writing Windows drivers, you probably think IRP handling is "no big thing." After all, you just call IoMarkIrpPending if you need to, and return an appropriate status from your dispatch routine, right? And IRP completion routines probably seem pretty straight forward too, right? Well, surprise! Once you get beyond the basics, the details of IRP handling is a mine field. Sometimes even trying to do something "simple" can get you in trouble! 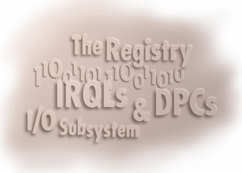 This artile presents a set of rules on IRP handling that were developed by the expert members of the Windows system software community (via the NTDEV and NTFSD lists). Read 'em, follow 'em, and you'll stay out of trouble (and save yourself a ton of time in the process).